Designed for children in pre-k, preschool, and kindergarten, Ava is a kids mode providing security and safe, quality content on your child's or your own device. With this parental control app, expect less time on Youtube Kids and more time on educational apps! With Ava, you are fully in control - even from your own device thanks to our cross-device capabilities. You can set time limits and monitor activities. More importantly, you can choose the best apps for your child’s growth and Ava rewards them for using those apps. Download Ava today, and it will be up and running for your child in less than 5 minutes. It’s that simple and easy. Only want your child on the device for 2 hours, max? No problem. Ava lets you set time limits. You can even prevent access during school hours, nighttime, or whenever. See what your child has been up to. What apps did they use the most? What games did they play? Ava gives you insight into your child’s interests and gives you something to talk about. With Ava, you’ll be guided to the most educational apps, and you have complete control over what apps and content you want your child to use. Your child won’t even see the other apps. Parental control is important, but children resist restrictions. Ava focuses your children on rewarding activities and helps them learn to manage screen time on their own. 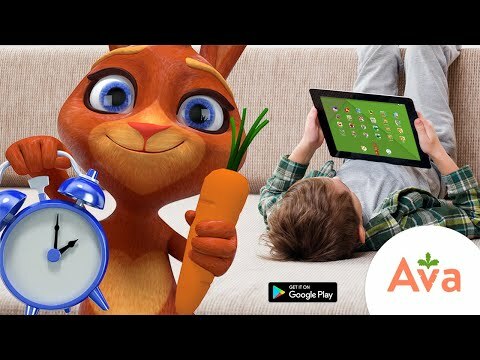 Ava the Hare rewards kids for using the good apps that you want them to use, and then kids can spend those rewards to play games. Ava - Kids Mode, Screen Time Parental Control was added by unclewilliam in Nov 2018 and the latest update was made in Jan 2019. The list of alternatives was updated Nov 2018 There is a history of all activites on Ava - Kids Mode, Screen Time Parental Control in our Activity Log. It's possible to update the information on Ava - Kids Mode, Screen Time Parental Control or report it as discontinued, duplicated or spam. Easemon logs keystrokes, chats, websites, screenshots, applications on Windows and macOS. Alternatives to Ava - Kids Mode, Screen Time Parental Control for Android, Windows, iPhone, iPad, Mac and more. Filter by license to discover only free or Open Source alternatives. This list contains a total of 21 apps similar to Ava - Kids Mode, Screen Time Parental Control. No reviews yet for Ava - Kids Mode, Screen Time Parental Control, want to be first? Maybe you want to be the first to submit a comment about Ava - Kids Mode, Screen Time Parental Control? Just click the button up to your right!